The Competition Ordinance (Cap. 619) (“CO”) came into full operation in Hong Kong on 14 December 2015, exactly three and a half years after it was first enacted on 14 June 2012. The CO aims to prohibit conduct that prevents, restricts or distorts competition in Hong Kong, and mergers amongst carrier licence holders under the Telecommunications Ordinance (Cap. 106) that substantially lessen competition in the telecommunications sector in Hong Kong. DVC is proud to be at the forefront of this rapidly developing area of the law. 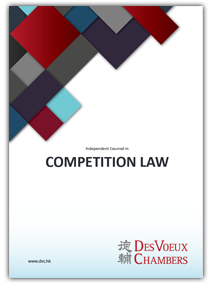 Our members have appeared in many of the first landmark cases in Hong Kong on competition law and regularly advises corporations on competition, regulatory and other related issues. Combined with our wealth of experience and expertise in public and constitutional law, commercial litigation, as well as dealing with regulatory authorities such as the Securities and Futures Commission and the Communications Authority, we strive to become the preeminent set for all competition law related matters in Hong Kong. Catrina has significant experience in handling competition law matters. She advised and appeared on behalf of the Competition Commission in Competition Commission v Nutanix Hong Kong Ltd & Ors (CTEA 1/2017), the first enforcement action brought before the Competition Tribunal. She is also acting in Taching Petroleum Company Limited v Meyer Aluminium Limited (CTA 1/2018), the first case in which an alleged competition rule infringement is being raised as a defence to a claim. She has advised undertakings in various sectors including telecommunications, raw materials, and financial sectors on a broad range of competition issues. She appeared on behalf of PCCW-HKT in two of the first cases on competition law before the then Telecommunications (Competition Provisions) Appeal Board (led by Sir Peter Roth QC, currently The Hon Mr Justice Roth of the High Court of England and Wales and the President of the Competition Appeal Tribunal in the United Kingdom). She is on the Competition Commission’s Panel of External Counsel and was recently appointed as a Non-Governmental Adviser to the International Competition Network. She is the Vice Chairman of the Hong Kong Bar Association’s Special Committee on Competition Law. In October 2016, she was selected by the Hong Kong Bar Association as one of four counsel to undertake a secondment at Monckton Chambers, as a leading London set specialising in competition law. She obtained a Master of Arts in EU Competition Law with Distinction from King’s College London in 2018. Catrina Lam of Des Voeux Chambers was ranked an Up and Coming Barrister in Chambers & Partners 2018 and 2019. She operates "across a broad swathe of the civil law spectrum" but "stands out in the opinion of many commentators for what one calls her 'depth of knowledge of competition law in Hong Kong, the US and the EU'", one interviewee maintaining that she has "pretty much monopolised the market in this respect". Sources also highlight her ability to work within a team as "a very important and significant part of her capability," and they further praise her quickness on her feet," "strong legal literacy" and instinctive recognition of "when to advance and when to retreat." John obtained a distinction in the competition law paper in his BCL degree. He has been actively developing a competition law practice in Hong Kong. In 2015, he acted as junior counsel for the Communications Authority in Hong Kong (led by Mark Hoskins QC from Brick Court Chambers in London and Johannes Chan SC from Denis Chang’s Chambers) in a judicial review, culminating in the Honourable Mr. Justice G Lam’s judgment in Television Broadcasts Limited v Communications Authority & The Chief Executive in Council  2 HKLRD 41, a landmark decision in Hong Kong discussing the general principles of competition provisions and other important issues such as the standard of proof in competition law proceedings. In January 2016, he was appointed to the Hong Kong Competition Commission’s Panel of External Counsel. In October 2016, he was selected by the Hong Kong Bar Association to undertake a secondment at Brick Court Chambers, a leading London set specialising in competition law. Connie studied Competition Law at the University of Oxford whilst doing her BCL. Since 2016, she has been on the Competition Commission's Panel of External Counsel in Hong Kong. She was also selected by the Hong Kong Bar Association as one of the four counsel to undertake a secondment at Brick Court Chambers in London where she spent two weeks with Mr. Robert O’Donoghue, a leading competition practitioner. She receives instructions from time to time to advise on competition law matters. She is acting for one of the parties in the second case brought to the Competition Tribunal: Competition Commission v. W. Hing Construction Company Limited & Ors CTEA 2/2017, involving allegations of market sharing and price fixing for interior decoration at a new public housing estate. Ebony has a broad commercial practice including public law, company and commercial matters. She joined DVC in 2012 after graduating from Oxford with a BCL and ranking first in her LLB degree at Hong Kong University. She specialises in Competition Law during her Master's degree at Oxford University, and has given talks on the new Competition Ordinance upon her return to Hong Kong. Martin is a Rhodes Scholar, and is also a Bar Scholar and a Charles Ching Scholar. He obtained a Distinction in the postgraduate BCL degree at the University of Oxford (during which he read competition law), after graduating at the top of his HKU LLB class with First Class Honours. Martin's practice covers both advisory and advocacy work in a broad range of civil matters, including competition law. He is also a Committee Member of the Hong Kong Bar Association's Committee on Competition Law. Kelvin specialises in competition law as a practising barrister in DVC and an academic at the University of Hong Kong, where he continues to teach and research in competition law. He has considerable experience handling competition law matters involving dispute resolution, exemption/exclusion-related applications, and advisory/consultancy work (including pre-IPO opinion). He has advised the Hong Kong Competition Commission and private parties in various sectors of the economy (including the financial, media, professional and retail sectors). He was an ad-hoc consultant to i-Cable in the Communication Authority’s Preliminary Enquiry (OFCA/M/BO2/1-12) leading to the early 2016 decision that i-Cable had no case to answer. Jonathan joined Des Voeux Chambers in 2015. He studied Economics at the University of California, Berkeley, and graduated with Distinction. Following this, he obtained his JD degree from the University of Hong Kong with First Class Honours and his LLM degree from the University of Cambridge, during which he read competition law. Jonathan has a broad civil and commercial practice, including company, commercial and regulatory matters. Stephanie accepts instructions for both advocacy and advisory work on a wide range of areas of law, including competition law. Prior to joining the Bar, Stephanie has read and obtained distinctions in EU and UK competition law at the University of Oxford and US antitrust law at the University of Hong Kong. She was also a research assistant to Mr. Thomas Cheng (competition law specialist and a member of the Hong Kong Competition Commission) and has conducted research on diverse competition law issues. Cherry is developing a broad practice in civil and commercial law, including competition law. She has been involved in both advisory and advocacy work in relation to competition law. Prior to joining the Bar, Cherry has read competition law as part of her BCL degree at the University of Oxford and obtained a distinction in the subject. Tommy Cheung is a Bar Scholar. He joined Des Voeux Chambers in 2017 after obtaining a Distinction in his BCL from the University of Oxford, with a prize for best performance in Corporate Insolvency Law. He also received First Class Honours in both his LLB and BBA (Law) (Majoring in Accounting) from the University of Hong Kong, ranking first in his year. Tommy appears regularly in the High Court as an advocate in his own right and as junior counsel. On top of advocacy work, he advises on a broad range of civil matters, including competition law. He was a research assistant to Mr Thomas Cheng (competition law specialist and a former member of the Hong Kong Competition Commission) and has conducted research on diverse competition law issues. He has also given talks on a wide range of legal matters, including the Competition Ordinance (Cap 619). Appearing in the first case to be considered by the new Competition Tribunal, this Silk is esteemed for being “an excellent strategist and a most effective advocate who knows how to package a case and what points to push.” A favoured choice in judicial review cases, he is also sought after for technology related and competition disputes. "One of the very few Hong Kong barristers with experience of handling competition cases," she is particularly known for "quickness on her feet" and her "instinctive recognition of when to advance and when to retreat."